Although we think we discovered almost every corners of the Earth, from the snowy mountain tops, all across the dreary deserts, to the very depth of the seas, we like to believe there are still some mysteries left unsolved - and that mighty creatures, like dragons, could still be hiding somewhere secretly. But are there any signs that could indicate the existence of such beasts? Before we answer the question above, we must take a closer look at how dragons appeared in different cultures around the world - because, while their existence was an important part of most ancient cultures, there are huge differences between the way people of different cultures imagined the nature and body of these fearful, yet magnificent beasts. When mentioning dragons, many people will automatically think of the typical "European" dragon, with scales on its serpent-like body, flames coming out of its throat, and perhaps bearing bat-like wings. 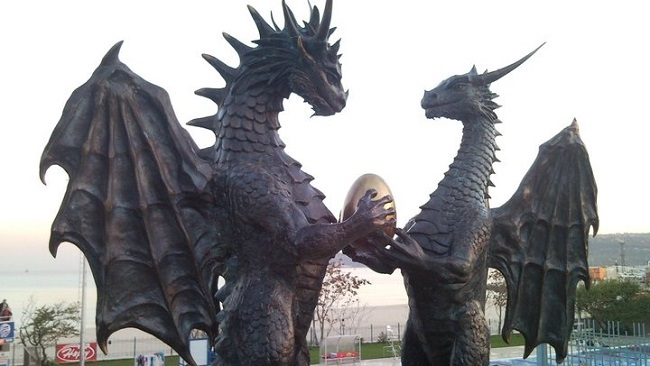 Or, more accurately, Western European dragons - because even European cultures have different kinds of dragons. In ancient Hungarian folklore, the dragon looks nothing like a reptile, except for the scales on its body - instead, it has the features of a massive (mostly male) human, and it usually has one, three, seven or twelve heads (each one symbolizing one soul), sometimes paired with wings. True, that it looks more like William Blakes Great Red Dragon than a "traditional" one, but this is how Hungarians imagined these beasts... Another interesting thing about this dragon is that its usually associated with whirlwind. There is, however, a more "typical" dragon in Hungarian folklore too, which belongs to a weather demon-like figure, called the garaboncias. The garaboncias knocks on the doors of the houses asking for food (typically eggs and milk), and whenever hes not given enough, he mounts his "dragonserpent" to create hailstorm and thunder - while the tail of his beast blows the rooftops down. These dragons were said to hatch from the eggs of black hens. In Norse mythology, theres also a somewhat more atypical dragon - Jörmungandr, also known as the Midgard Serpent does not have wings, and it doesnt breathe fire, but instead lives in the water and is so large it could wrap its body around the Earth and grasp its own tail. As for the ancient Greeks, they also had a dragon called Python, that looked more like its medieval European counterparts, but unlike them, Python lived in the centre of the Earth. Ladon was another serpent-like Greek dragon, who guarded the golden apples in the Garden of the Hesperides. Contrary to the European dragons, the Chinese lung - that is usually also regarded as a dragon - is considered to have power over rain, and is basically associated with good fortune and some deities. It was not only Chinese dragons that were associated with water, but also Korean and Japanese ones, which all had distinctive long and serpent-like bodies. "I will not fail to speak of Leviathan's limbs, its strength and its graceful form. Who can strip off its outer coat? Who can penetrate its double coat of armor? Who dares open the doors of its mouth, ringed about with fearsome teeth? Its back has rows of shields tightly sealed together; each is so close to the next that no air can pass between. They are joined fast to one another; they cling together and cannot be parted. Its snorting throws out flashes of light; its eyes are like the rays of dawn. Flames stream from its mouth; sparks of fire shoot out. Smoke pours from its nostrils as from a boiling pot over burning reeds. Its breath sets coals ablaze, and flames dart from its mouth." The dragons described above are quite different form each other, as you can see, and it shows just how diverse the dragon-related legends and myths are. The book "Giants, Monsters, & Dragons: An Encyclopedia of Folklore, Legend, and Myth" written by folklorist Carol Rose also discussed the varying features dragons have - according to the book, while dragons have the head of a lion or bird of prey in the Middle East, the ones in India can even have the head of an elephant - and their colors can also range from green, red and black to blue, white, and even yellow. Others assume that real dragons did, or do exists - and although there is no reliable evidence for this presumption, some interesting discoveries were said to be made. The Jebal-Barez skeleton was one popular story about finding the remains of an enormous dragon-like creature, but while the story became popular in some countries, it was actually a hoax, said to be created in order to promote a PS2 game called the Shadow of the Colossus. Another memorable story of a dragon's fossil started spreading in 2017, after some claimed to have found the skeletons of a real, 18-meter-long (60ft) dragon. It later turned out that it was a prank - with the fossil consisting mostly of cows and sheeps bones. Fossils of the lepidodendrons - an ancient, extinct genus of tree-like plants - also confused some people at times, for these fossils look like scales of a huge and strange reptile-like animal. While theres no physical evidence of the existence of dragons, some think that the fact theyre mentioned in the folklore of so many different cultures proves that similar animals could be seen by people in ancient times. Yet, the differences between those legendary dragons around the world - discussed above - seems to contradict this assumption.